A few weeks ago I noticed that a friend and colleague in the field created a plugin for Adapt. I had heard of Adapt before but never thought to give it a try. Adapt is free and open source. There is an authoring tool (which I don’t cover in this post) and a framework both for creating responsive e-learning. Note: I know I said it already but please be aware I am not covering the e-learning authoring tool. I am covering the framework which allows you to edit more code. Adapt’s package outputs as SCORM 1.2 but it looks hopeful that xAPI might be on it’s way. There did seem to be an xAPI plugin for it. So, what’s all the fuss? Why should both Designers and Developers check it out? 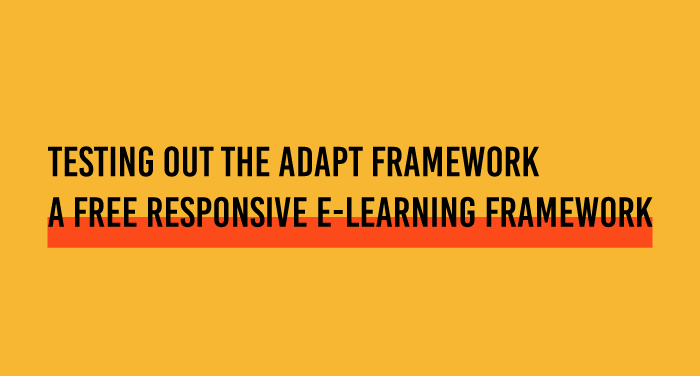 You can check out tons of examples of courses built with the Adapt Authoring Tool and Framework here. Getting the Adapt Framework installed isn’t super duper intuitive but I taught myself a lot about using the Command Prompt. All of the learning I picked up in installing it made it a very sweet experience. Here’s how I installed the Framework (probably not 100% correct but it worked.) This is a Windows example. I don’t cover too much on editing, such as really customising what’s on the page, because I haven’t gotten into it yet. Check out as I go through editing colours and text. See what I changed here, including colours, font style, and making the titles on all pages bold. The folder with your SCORM 1.2 files will be titled build. Simply zip the folder and load it onto your LMS like you would any other zipped course.